By this point in our gaming lives we’re fairly used to crossover characters, developers stripping fan favourites from the different universes of gamedom and collecting them together in a single title. Gordon Freeman appearing in Renegade Ops, say, or Poker Night at the Inventory sitting Max from Sam & Max at a table with Tycho from Penny Arcade. But SEGA have gone off the beaten track a little with the casting for Sonic and All-stars Racing: Transformed. You can play as Manager from Football Manager. Clearly SEGA have been lifting from their own catalogue of games, as well as borrowing from Valve, but Football Manager and Shogun 2 seem a little bizarre choices as neither are actually characters, the football manager in football manager is an intangible entity which you define and the generals in Shogun are, well, again you and an endless line of interchangeable soldiers you’re willing to have die for your cause. Something from the Aliens franchise could have been a better fit. This all said, while the character choices are a little strange, as RPS point out, Eurogamer were extremely taken with what could have been a throwaway game. Also, it’s not like the PC racers are the only characters in the game, there are a whole slew of past and present SEGA console’s characters, too. 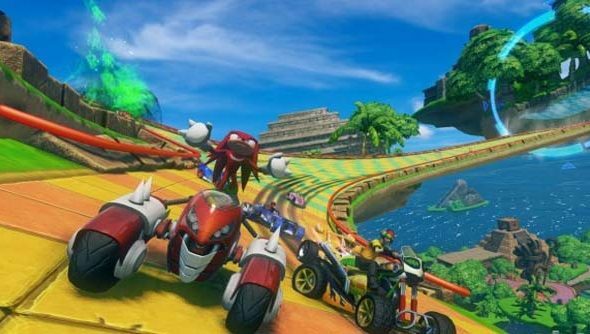 Sonic and All-Stars Racing: Transformed is an awful name though. Still, it’s coming out on 31 January.